Our favourite foodie friends are back and being put through their paces by their local branch of Super Slimmers. Hilarious and packed with warmth, the award-winning TV drama Fat Friends has been adapted for stage by Kay Mellor but revisits the lovable characters we fell in love with on the telly. Jodie Prenger landed the role of Nancy in Cameron Mackintosh’s revival production of Oliver! at the Theatre Royal, Drury Lane, after winning the BBC1 programme I’d Do Anything, and she hasn’t stopped since. The chatty and lively actress has starred in productions such as Calamity Jane and Spamalot, has toured the UK and is no stranger to the fun of panto. “The longest tour I have done was Calamity Jane. This one has not felt long but it is a fun show,” said Jodie. 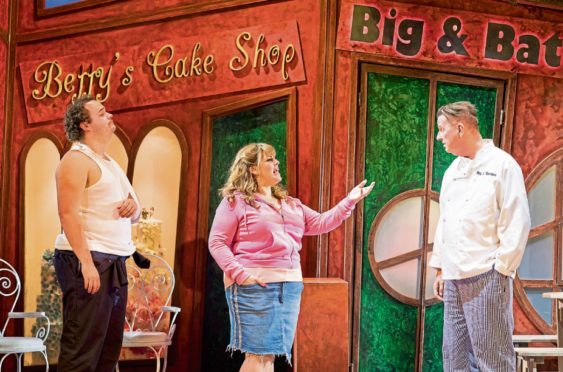 Now Jodie joins Scottish stage stalwart Elaine C Smith and former Coronation Street regular Kevin Kennedy on stage for a tour of the hilarious Fat Friends in the lead role of Kelly Stevenson, who is planning her upcoming wedding with fiancé Kevin. She has dreamed about her wedding all her life but has recently put on a lot of weight without realising it. The wake-up call comes when Kelly can’t get into her dream dress but buys it, anyway – two sizes too small. “A gentleman named Andrew Lloyd Webber put my name forward for the show, which was amazing. He is so, so supportive,” said Jodie. Many people will remember the original show, which ran on ITV from 2000 to 2005. The much-loved programme had four series and picked up numerous awards and the musical is very close to the show it was based on. “It is a quite similar story, just condensed a bit,” said Jodie. “The storyline is the same and Kay has managed to fit the best in, based on the series. 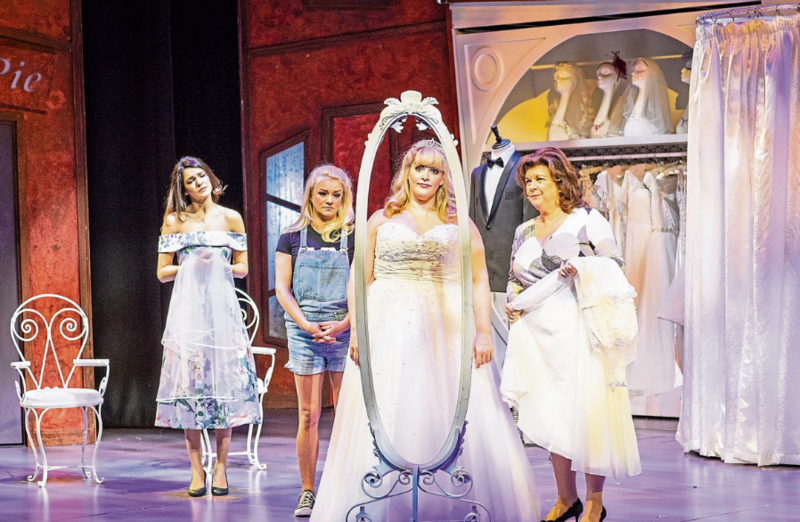 To the sounds of original music by Nicholas Lloyd Webber, Jodie gets into the character of bride-to-be Kelly, who is fantasising about squeezing into the outfit of her dreams – something many audience members will be able to understand – despite her Super Slimmer and yo-yo dieting mother, Betty. Nicholas Lloyd Webber, son of the legendary Andrew Lloyd Webber, has been making music his whole life. A composer, songwriter and record producer, Nicholas joined the Fat Friends creative team after gaining international attention for his film scores, television work and theatre credits. “Kelly is happy and is in love but is feeling the pressures of the outside world,” said Jodie. Rehearsals were a long process and lasted well into the evening but that is the “nature of the beast” and the process was all very upbeat, according to Jodie. Now, the cast and crew are on the road, visiting Aberdeen this month before heading down to Blackpool. “You always notice a difference in the audiences on tour but we’ve been finishing with a rapturous applause,” said the actress. Jodie believes the show portrays the important message of always being good to yourself, as you never know what is around the corner. Even though she enjoys doing the play, including a little fun and girly section in the bridal shop, the musical gives a positive message to audiences, which is important to her. “People should come with a full stomach,” said Jodie.